"So, are you ready to play? Since many of us have been counting down the days until Spring, I thought it would be a perfect time for a color challenge. Everything is coming back to life. No more brown grass, or bare trees. Color is emerging. So, lets go 'au naturale'! Use all neutrals: white, ivory, gray, black, or brown, with a splash of color to represent the arrival of Spring." 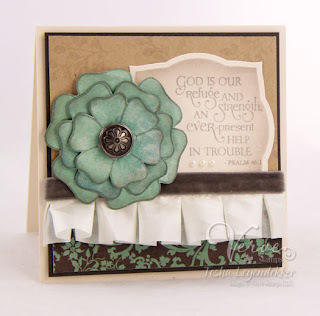 Isn't Tosh's sample using Great Friend and Psalm 46:1 just beautiful? I can't wait to play along! So what are YOU waiting for? Check out the Get Your Diva On challenge thread in our forum for all the details on how to submit your entry. Deadline for entry is this Sunday, March 20 at 9PM Mountain, so don't delay! It's been a while since our last release, but have no fear, new Verve is almost here! The design team is busy making samples to put a little spring in your stamp and our next release is right around the corner! Save the date for Friday, March 25, as we issue in a new crop of spring critters. We'll be putting on our New Release Spotlight Hops next week, then start revealing the new sets at our release party over in our SCS Forum starting at 9pm Eastern, Friday March 25. We hope to see you there! 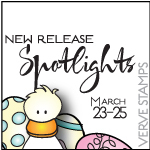 I know, we haven’t even had our March release yet, but as I was catching up on some blog reading I spied a preview of a set and some dies releasing this week from another company that have similarities to designs that Verve will be releasing in April. My friend Claire, owner of Waltzingmouse Stamps, ran into a similar situation a few months back and I admired the way she handled it. So I’m taking a cue from her and noting that Verve has a set and coordinating dies already in production. My set concept started back in December on a shopping trip, where I came across a hand towel with lovely solid flowers that had several different flower centers. I thought it was a great concept for a stamp set that would work well with new and existing dies. Soon after, I started designing flower and leaf images for the set and coordinating dies, intending them to release in April, just in time for Mother’s Day crafting.